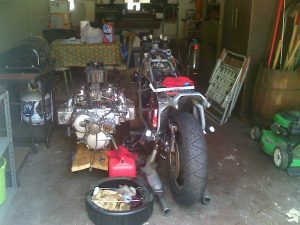 Back about the beginning of 2009, if the dates on the pictures are to be believed, I dismantled and reassembled my motorcycle. Often I disassemble things just because, wife is always amused how long I own a thing before it gets taken apart. Well this one was due to a vehicle accident. A drunk lady drove down the wrong side of out darkened street. Hit the front of my bike, bouncing it into my minivan. 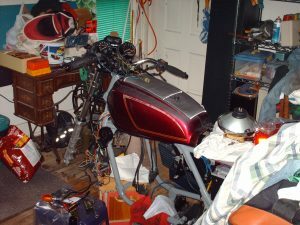 Both were a total loss, the bike because the frame and forks were bent, the minivan because the fender was slightly bent, and the paint job was worth more than the vehicle. I was inside watching TV when it all happened., yay. 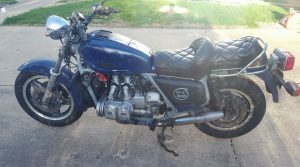 It took a while to gather the parts, my 1982 GL1100 Interstate became a “198…something” standard. 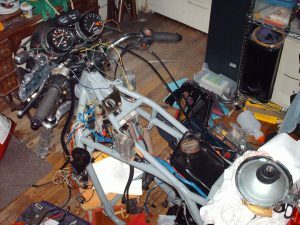 The engine, wheels, fenders, headset, faux tank and rear swing arm are original ’82, forks are ’81, Choke and handle bar controls ’83, frame from 1980. Speedometer from Acewell and some Drag bars replaced the original Honda handle bars. 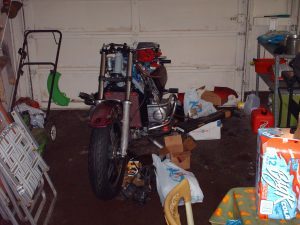 Taking the engine out made the whole bike look tiny! People still tell me it is a big bike, I don’t see it, now it is a 600 some-odd pound scooter bike. The frame I brought upstairs and painted it Rustoleum grey. Ripped out all the wiring and cut out everything that no longer went any where. I will say after putting it all back together it was so nice to turn it on and it worked. I do not know what I would have done if I had to go through all the wires again. 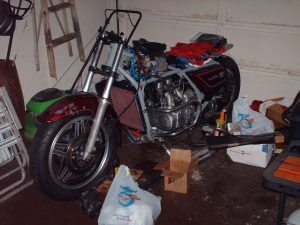 Treaks that were made after reading extensively in Forums like “Naked Goldwings” after putting the forks back on I slid the head set down 1 inch to improve steering, I like it. Avon tyres, because I wanted a little more stiction to the road. 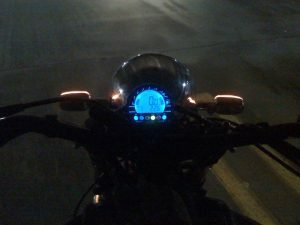 LED headlight bulb and have replaced the stock mufflers with a pair of stock Harley mufflers I got cheap on ebay. I did repaint it (Rustoleum Blue – “Mopar roll on paint job”!) and have gotten a better seat, even rode it around Lake Michigan just like it sits.